Home Rule is closing this weekend after 20 years of operating in our neighborhood! We thank the owners for taking a chance on us and succeeding when the odds were stacked against them. They were the only bright retail spot in a boarded up area. Now we are thriving and we have diverse retail. Again thanks to these urban pioneers and we wish you good luck in your next endeavors! This month brought the sudden closing of 17 Taylor Gourmet stores due to investors pulling out.. The notice on the front door simply states "no mas" or "no more" store. On the bright side, The Sonnet apartments (located next to the Reeves Center) are now completed and ready to occupy. Retail spaces are available and we are excited to see what comes to our neighborhood!​ For more informaation please visit their website. The Smith restaurant has opened at the 13/U apartment building. It is an American Brasserie that was founded by celebrity chef Brian Ellis and his partners from NYC. It is the second location in DC...the other is in Penn Quarter. To learn more, please visit their website. Today we remember the riots that filled the 14th and U community with fires and smoke after the killing of Dr. Martin Luther King Jr. According to published reports, several hundred stores were damaged or destroyed, looting was widespread, and 12 people died. Troops patrolled the area as documented in photos shown here. Other parts of the city also experienced rioting, including Columbia Heights, H Street and 7th Street. Pictured above (courtesy of the DC Public Library) are the NW corner of 14th and U (on the top) where the Reeves Center building now sits. It opened in September of 1986 and has served as a magnet for redevelopment of the area. The other photo is the corner of 14th and S looking northward. The Black Cat nightclub now occupies the building shown on the far right side of the photo. Rumors abound that a bank is coming to the SE corner of 14th and U. So we checked with DCRA and learned that Capital One Bank applied for permits to renovate the space formerly occupied by Cricket. They will join Wells Fargo, BB&T, Sun Trust, and Bank of America with locations in the 14th and U area. Originally, only the historic Industrial Bank served our neighborhood with 2 locations...one in the Reeves Center and the other at the corner of 11th and U. 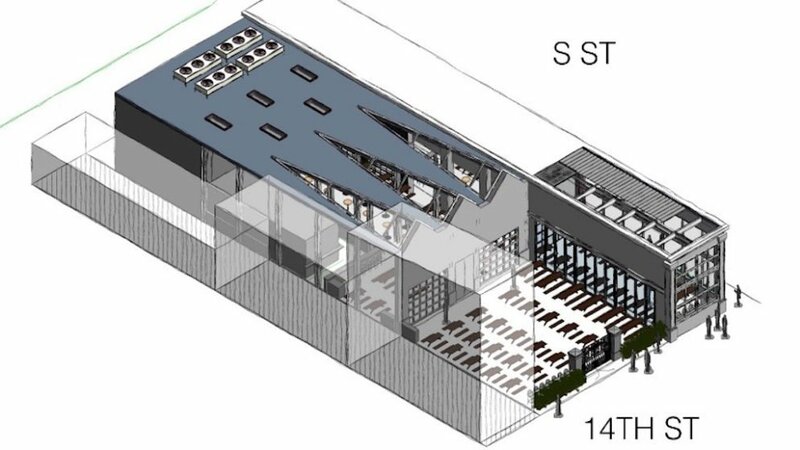 The ABC Board has issued a decision on Dacha’s 14th St. application. They reduced Dacha’s occupancy from its original request of 600 persons to 200 persons–a 2/3rds cut. They also rolled back the requested hours of operation from 2 am to 1:30 am on Sunday through Thursday nights and from 3 am to 2:30 am on Friday and Saturday nights.. They limited the outdoor cafe hours to 11 pm and 12 midnight respectively. The ruling also limits the seating in the outdoor cafe area to 150 and stipulated that it would count toward the 200 person cap. UPDATE: The board has also rejected recently a subsequent request by the applicants to add 50 more persons to their capacity (this request was made after they learned of the reduction to 200 persons). BRESCA has opened in the old Policy Restaurant first floor space. Policy is now upstairs and continues to serve brunch. 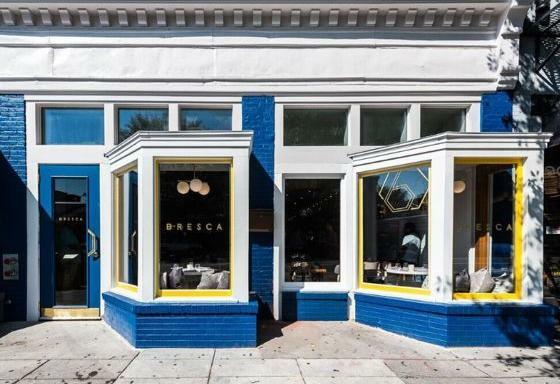 BRESCA is Chef Ryan's new incarnation of his Cleveland Park restaurant. To see their menu offerings, please visit their website. Jeni's Ice Cream is coming to the corner of Wallach Place and 14th Street. Jeni's is based in Columbus OH and they serve a variety of flavors that you can sample right now at Whole Foods. Please visit their ﻿﻿website﻿﻿ for more about their ice cream. 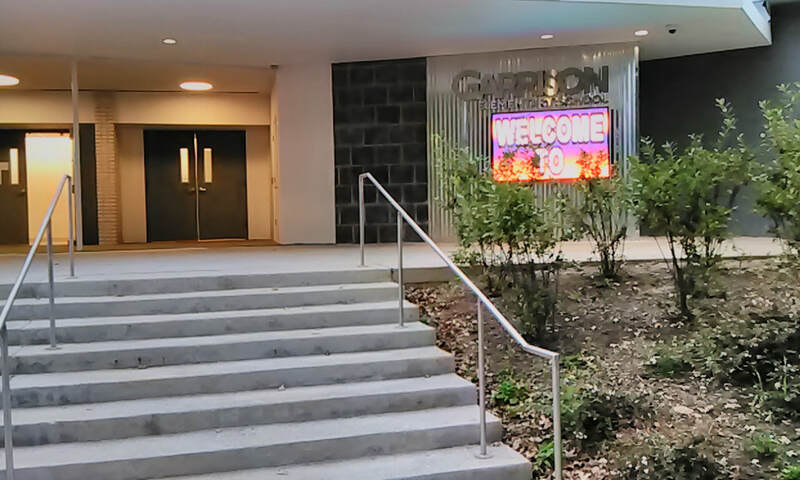 Garrison School hosted its Grand Re-Opening this week and I was pleased to attend to see the renovations and plans (shown below) for the areas in the rear of the building. I was serving on the ANC when we wrote letters to the DC Council to speed up the funding of the renovations when it looked like they were dragging their feet. Then I served on the DCCA Board of Directors and we wrote letters asking for the same speedup in spending. Clearly, there is a lot of community support for this project since we have seen an increase in the number of families in our neighborhood. Congratulations to all who made the improvements possible for our own neighborhood school! The project located at 13th and U is now done; the apartments are ready to rent; and the Rite Aid drug store is stocked and open for business showing off its new slick look. The apartment building has 130 one and two bedroom apartments available to rent. Please click on to the link provided to learn more about the size of the apartments, floorplans, amenities and the rents. 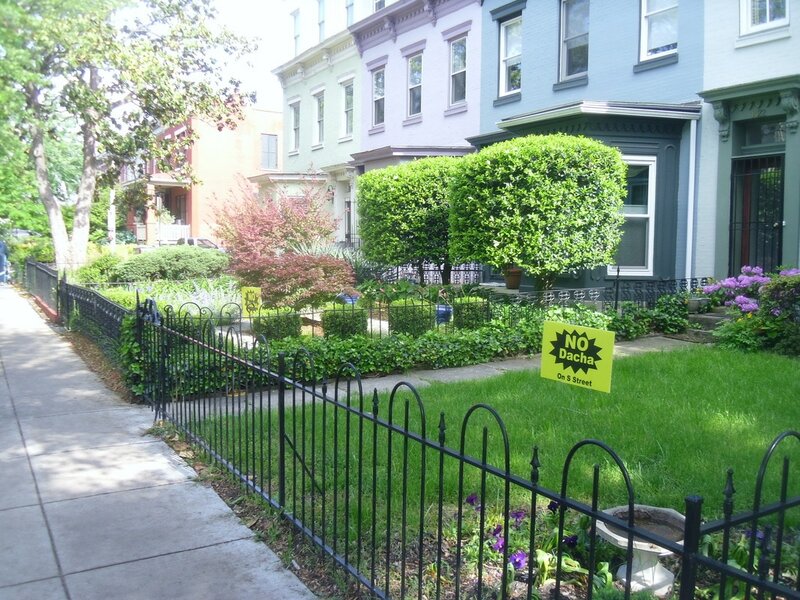 ANC 2F met June 7 and decided to protest the application by Dacha Beer Garden to open another location at the corner of 14th and S. They listened to affected neighbors testify about the impacts and inappropriateness of this establishment. During the month of June ANC1B and 2B met to consider the application and also decided to protest. 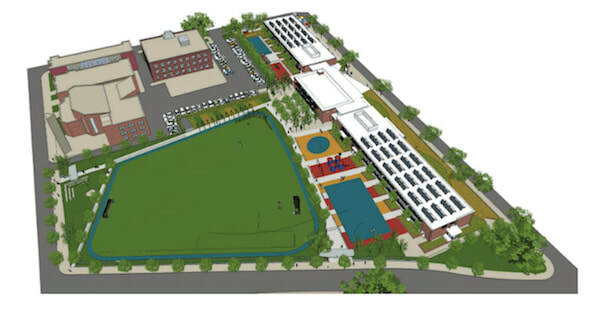 ​The capacity is estimated to be 600 people occupying the indoor and outdoor spaces, including use of the public space along S St. It is located across the street from another beer garden, Garden District. Residents have posted "No Dacha" signs in their front yards to register their protest. They plan to file a formal ;protest soon. Two civic associations, the Dupont Circle Citizens Association and the Shaw Dupont Citizens Alliance, are planning to protest the application. ​lululemon opens in the Elysium building on 14th Street between Wallach Place and U Street. We welcome them to our neighborhood and we look forward to an additional tenant at the corner in the rehabbed historic building. Madewell jeans for women is locating at the former home of Universal Gear at the corner of Wallach Place and 14th (see below). 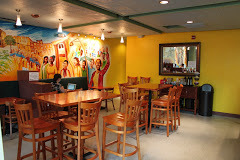 Also coming is the new Cuban-inspired eatery and coffee shop called COLADA located next to Lupo Verde on the T Street side (see photo above) and visit them at www.coladashop.com for more details about menus. ​Things are looking up for 2017! If you have not noticed, Bakehouse has left the neighborhood and its space is now occupied by Jubilee Ice Cream. Visit their website for more info on their flavor offerings (such as coconut lychee lime and honey lemon lavender) at www.icecreamjubilee.com. District Distilling Company has opened at 1414 U Street in the spaces formerly occupied by Coppi's and Utopia. I attended the opening and sampled the suckling pig dish along with their pecan pie dessert. Delicious! There is a distillery downstairs that will brew gin and vodka and the restaurant and bar are located upstairs. The space is minimal--stripped down to the brick walls and wooden floors and the lighting is bare bulbs so don't expect a lot of ambience. They serve a number of signature cocktails and they have a retail store to sell their spirits to the public. Universal Gear is closing its doors according to owner David Franco who said recently that the retail world is challenging and he wants to move on to pursue other things. He is currently developing several properties in DC and NYC. We will miss this wonderful shop at the corner of 14th and Wallach Place! Peet's Coffee has opened on 14th Street joining other local coffee shops. On a recent visit I noticed quite a few customers on their computers mid-afternoon. So if you want to get a hit of caffeine in order to get some work done...this is the place...cool ambience! New eatery opens....Jimmy John's. Located next to the McDonald's at the corner of 14th and U next to the bus stop, it promises an array of sandwiches for your eating pleasure! We like seeing more affordable places opening up in our neighborhood...more choices for lunch! You can order online at www.jimmyjohns.com. Plan to visit these open studios and see what our local artists are making. For those of you who are new to our neighborhood, we live in the Uptown Arts District which includes the 14th Street corridor as well as the U Street corridor. We support our local artists! Click here for more information. 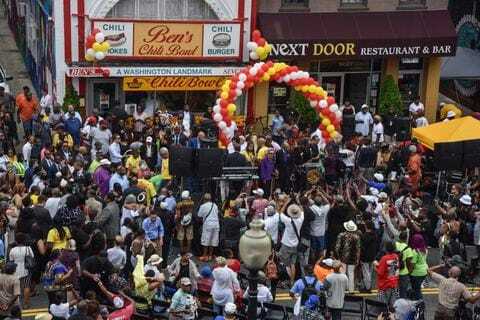 The annual Funk Parade will be marching through our neighborhood on Saturday, May 7. According to the organizers, over 70,000 people will be visiting our local area. The photo of last year's parade is courtesy of their website. Don't forget to check out the art fair across the street from the Reeves. Enjoy the marching bands and dance troupes! Various sources are reporting that this jazz venue has closed its doors forever. The current owners have not renewed their lease and have cited a dwindling number of customers due to the proliferation of clubs and restaurants in the 14th and U corridor. There are simply too many choices say the owners. Many jazz greats have performed there including Billie Holiday, Duke Ellington, Ramsey Lewis, Satchmo, Miles Davis and Shirley Horn. We will miss this very important part of Black Broadway! The annual rite of spring begins on March 1 with DPW sweeping the streets so please remember to obey the signs and move your vehicles accordingly. Hopefully none of our neighbors will be ticketed! Lupo Verde is celebrating Valentine's Day by decorating its exterior facade with hearts and best wishes for love. One valentine caught my eye: Love is the irresistible desire to be desired irresistibly. Take your loved ones out to brunch or dinner tonight! Another establishment closes on U Street...The U Street Cafe. This was always one of my favorite places to get coffee and have a conversation with neighbors. Their lunches and brunches were great but there has not been enough daytime traffic and customers to sustain the cafe. This continues to be an issue for our 14th and U neighborhood businesses as several operators/owners of local eateries have told me that they are worried about the lack of daytime customers. They state that they are busy on the weekends but this is apparently not enough to be successful. Cakelove closes its doors after many years in our neighborhood. The owner, Warren Brown, has announced that he will be consolidating his bakery operations into a warehouse in Alexandria. His sales will come from doing most of his business online and in selected small boutique cafes in the region. We will miss the great cakes and cupcakes!! The Elysium Fourteen project at the corner of 14th and Wallach Place is coming along. It was approved a few years ago and it will contain 56 luxury rental apartments with retail on the ground floor. The developer, Madison Investments, is going to restore the historic corner building that long housed a beauty salon. Rumors have it that Urban Outfitters is opening a store there. Looking forward to more changes in our urban landscape! Our neighborhood is celebrating the artists "in residence" this weekend. Click on to the MidCity Artists' website to review the schedule and to view the map of open studios at http://www.midcityartists.com. 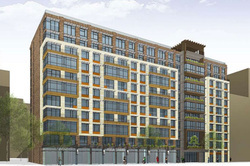 The Portner Place redevelopment project is about to break ground on U Street between 14th and 15th Street. The project will occur in two parts...first the part facing U Street (set to open in late 2016) and the second the part facing V Street (set to open in late 2018). The U Street building will be 11 stories high and will have 250 to 270 market-rate units (mostly one- and two-bedroom apartments). There will be retail, possibly a restaurant, on the ground floor. The project is slated to provide an additional 50 units of affordable housing to the original buildings (that contained 48 affordable units) that will soon be demolished. The affordable units will be located in the V Street building. New rental apartments and condos abound in our neighborhood so tell your friends and colleagues! The attached graphic was produced by Sotheby's Realty and it shows how many buildings have been developed in recent years to provide additional housing and density in our urban neighborhood. Click on to the image in order to see a larger version for your reference and make plans to visit these developments! PACERS has opened at 1841 14th Street in the former Muleh shop space. Fitness-related businesses continue to locate in our neighborhood to serve our young and fit demographic. This store joins their other ocations in Alexandria and Fairfax. Soon they willopen in Navy Yard. lWelcome to all runners! This year the Capital Pride Parade is celebrating its 40th anniversary with over 200 participating groups and floats. It courses through historic Dupont Circle where the pride events originated and ends at 14th and R in our "neck of the woods." Over 350,000 people participate in the parade and festival. The Supreme Court will issue its ruling on gay marriage in the next two weeks before it recesses. Have fun everyone and celebrate! REALTORS love our real estate! McEnearney real estate joins three other real estate companies in opening an office in the 14th Street corridor. It will occupy the former PULP space located near S Street. PULP served the area for 14 years. Washington Fine Properties is slated to occupy the Bang and Olufson space near Q Street. Both real estate companies join Sotheby's and M Squared in our neighborhood. This is a sign that our properties have become very desirable and expensive! You can click through to my blog for more details. And keep checking here for late breaking NEIGHBORHOOD NEWS. --What happened to these 2 establishments? About 2B09: Our Single Member District includes the northeast corner of the Dupont Circle ANC. The boundaries include portions of U Street, 14th Street, New Hampshire Avenue, 16th Street and S Street, making it one of the most unique and diverse neighborhoods in WARD 2.